Are you having problems opening the driver’s side door? Let the emergency locksmith experts at Locksmith Oakland save the day! We have a knack for safely prying open stubborn door locks. You should never attempt to wrestle or use force with the door handle. We’re on hand 24/7 to make things as convenient as possible for you during an emergency lockout situation. Our team of certified emergency locksmiths will arrive within a half hour to help. Make sure you keep our number stored for easy-to-reach mobile access. Car doors can slam shut within the blink of an eye. They can cost a fortune to repair or replace at a local auto body repair shop. We have a patented method for safely repairing vehicle door panels or locks and the best part is that all work is done on the spot! Locksmith Oakland brings you fast and easy lockout coverage at prices you can afford. You won’t need to hit the panic button anymore or bang the steering wheel in frustration. We’ll be by in a jiffy to work our magic! We offer a wide scope of emergency locksmith services, which includes; 24/7 emergency lockout solutions, repairing chip keys, repairing vehicle door locks, installing window locks, replacing ignition keys, removing broken pieces from the ignition, professional lock picking techniques, duplicating car keys, laser key cutting services and much more. It takes a lot of hard work and commitment to rise to the top of the locksmith mountain. We’ve achieved great success over the years through our firm dedication to our customers. We’re the emergency locksmith company you can depend upon. We have an amazing roadside team that remains at your service 24/7. We take advantage of GPS technology to plug in the details with the least amount of traffic. 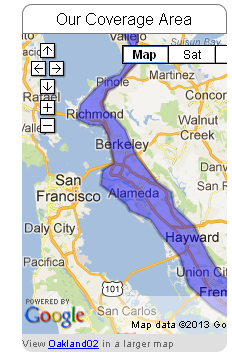 We know each corner and area within the Oakland city limits. If you’re unsure of your roadside location, just tell us with highway or intersection you’re stuck at. We’ll know exactly how to locate you within seconds! We’re a reliable and honest emergency locksmith with years of hands-on experience in the business. We’re always kept super busy with referrals from satisfied clients. Once you choose Locksmith Oakland, you’ll become another satisfied customer too! Our staff of customer care agents will be with you to answer any questions with a smile! Contact us anytime if you need help getting back inside your vehicle.